A small company for sensor technology usually solved customer problems like distance measurement without contact or gas mixture control. The team was informed about all the latest sensors and trained to come up with solutions even to really challenging tasks. This lead to a word of mouth recommendation for a new customer that promptly described his problem. The customer ran a workshop for physically handicapped people that mostly worked with wood and produced a wide variety of products that got sold on various markets. 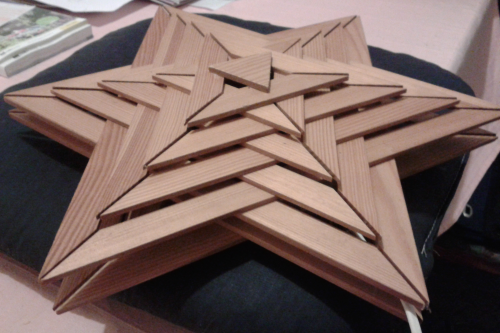 One product was the Christmas lamp in shape of a star. It proved to be a best-seller and had a good economic ratio. At least it could have, if only the rejects rate would be lower. To assemble the lamp from little wooden laths was difficult for skilled workers and even harder for skilled handicapped workers. 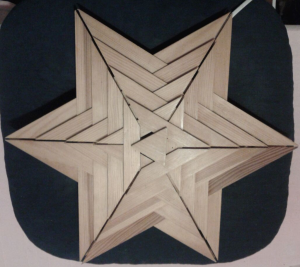 The main difficulty was to glue the laths in just the right angle to result in the desired star shape. The customer needed some set-up of sensors that would indicate to the worker when the angle was right. He imagined something like a cheap navigation system that would yell/display “left” and “right” until the angle was “correct”. The team accepted the task and started the creative solution process that lasted several days of thinking, doodling, researching and scribbling. Then, the team gathered for a solution finding session. A multitude of ideas were presented and almost instantly rejected. From laser distance measurement over acoustic ultrasonic sensors to camera-based image evaluation, everything cool and remotely feasible was presented and rejected because nothing had an even remote chance to succeed outside of laboratory settings. Not one approach survived the applicability check. The team was devastated and returned to the creative phase, if not as reckless as the first time. When the sensor technology company proposed this solution to the customer, he laughed loud and long. It was the most elegant and inexpensive solution he never thought of. It was exactly what was needed. It worked perfectly from the first prototypes onward. The Christmas lamp rejects rate dwindled to almost zero instantly. In short: perfect score. Just that the sensor technology company wouldn’t earn anything with maintenance or improvements was a minor drawback. This story is my illustrative material when I have to explain what good analysis is. Let’s take a look at the bafflement of the team: They had all started their solution finding with the premise that this was a problem inside their area of expertise. Even the customer said so. Good analysis works out the real nature of a problem regardless of what anybody says about it. This includes any description given by the customer or even the wood workers in charge of the actual work. Good analysis finds a solution that fits the problem, not the field of expertise of the analyst. Analysis is the process of thinking in terms of the problem space. In this story, an important part of the analysis was already done by the customer: Most of the rejects have wrong angles, so we need to make sure the angles are correct and we need a machine to tell us, because apparently the workers themselves can’t. The machine needs sensors, so lets assign a sensor company on the task. This was the initial premise that nobody except the student questioned. And this was half of the analysis that nobody bothered to repeat. You cannot really understand the problem if you begin your thinking mid-flight. It’s easy to tell a story (even if it really happened) and derive insights from it. It’s much harder to apply these insights in the own work. The crucial step is to fully understand the actual problem that should be solved (in the story: correct justification instead of correct angle). The next step is to incorporate the value system of the customer: if I alter some key characteristics of the solution, will it still serve the customer’s actual needs? In the story: A cheap aluminium mould serves the customer even better than some expensive fancy machine. The mould can be duplicated nearly infinitely, the machine probably not. The mould is grasped instantly, the machine needs instructions. The mould keeps working long after the machine ran out of battery. The mould assists, the machine merely scolds. If, after thoroughly working on these two steps, the solution lies still inside your field of expertise, you can proceed to design the solution. You’ve just left the analysis process to concentrate on one possible solution. That’s all right, but remember to return to the earliest steps of analysis when you get stuck. Designing a solution for a falsely analysed premise almost always leads nowhere in the long run.